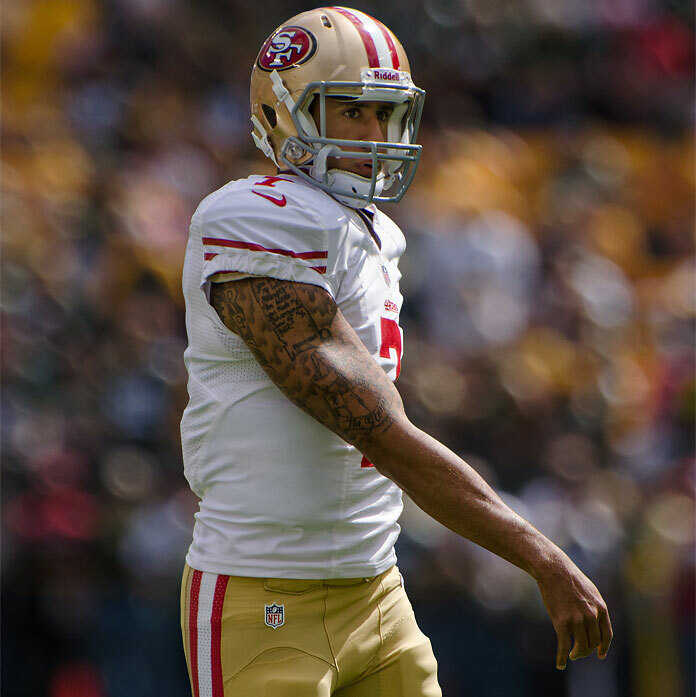 Before an NFL preseason game on August 26, 2016, San Francisco 49ers quarterback Colin Kaepernick sat during “The Star Spangled Banner,” flouting the tradition of athletes standing during the U.S. national anthem. During his post-game interview, he explained, “I am not going to stand up to show pride in a flag for a country that oppresses black people and people of color. To me, this is bigger than football and it would be selfish on my part to look the other way. There are bodies in the street and people getting paid leave and getting away with murder.” He added that he would continue to protest until the regular season starts and did so for the next two games. In his fourth and last preseason game, he decided to kneel (along with teammate Eric Reid) instead of sitting, in deference to the U.S. military and their families. Republican presidential nominee Donald Trump said that if Kaepernick was so unhappy with his country, he could move elsewhere: “You know, maybe he should find a country that works better for him. Let him try, it won’t happen.” The Santa Clara police union threatened to abandon their normal security duties for 49ers games if the team did not release or silence Kaepernick. In contrast, supportive fans have clamored for Kaepernick’s autograph, and his jersey sales are number one on NFL.com. Steph Curry of the NBA’s Golden Gate Warriors and NBA legend, activist, and writer Kareem Abdul-Jabbar both expressed their support for Kaepernick’s silent protest. It was a little nod to [Colin] Kaepernick and everything that he’s standing for right now. I think it’s actually pretty disgusting the way he was treated and the way that a lot of the media has covered it and made it about something that it absolutely isn’t. We need to have a more thoughtful, two-sided conversation about racial issues in this country. Being a gay American, I know what it means to look at the flag and not have it protect all of your liberties. It was something small that I could do and something that I plan to keep doing in the future and hopefully spark some meaningful conversation around it. It’s important to have white people stand in support of people of color on this. We don’t need to be the leading voice, of course, but standing in support of them is something that’s really powerful. Wahl also reported that Rapinoe planned to continue her protest, and she told Sports Illustrated that it would include U.S. national team games, if she were selected. It was announced on Thursday that U.S. Women’s Soccer coach Jill Ellis did select Rapinoe as part of the team that will play Thailand on September 15th and the Netherlands on September 18th. In light of Seattle Reign and U.S. Women’s National Team member Megan Rapinoe’s public declaration that she intended to “take a knee” during the United States’ National Anthem tonight, we decided to play the anthem in our stadium ahead of schedule rather than subject our fans and friends to the disrespect we feel such an act would represent. As a veteran-owned team, the national anthem holds an exceptionally special meaning for this organization. Our owner Bill Lynch has lost personal friends during overseas conflicts and has other close friends who have also lost loved ones. Playing the national anthem prior to sports events became standard during World War II and was a way to express the team’s and fan’s patriotism and show support for the U.S. Military. The tradition of honoring our military and our patriotism before our games is very important to us. We strongly feel that there are better ways to begin a conversation about a cause than tarnishing a tradition that is so important to so many. To willingly allow anyone to hijack this tradition that means so much to millions of Americans and so many of our own fans for any cause would effectively be just as disrespectful as doing it ourselves. Professional athletes have incredible numbers of followers, to which we believe they have the ability to articulate a conversation with objectives and plans and begin a serious conversation directly, or through traditional media appearances, without insulting our military and our fans. We do regret that this decision has denied the players who had no intention of taking a knee their own opportunity to honor our great country from the field. I didn’t hear it and I wasn’t exactly sure why it wasn’t played. It’s [expletive] unbelievable. Saddened by it. It’s pretty clear what the message is I am trying to bring to light in Chicago and what I continue to try to talk about the last few days. Clearly with [Spirit owner Bill Lynch’s] actions, it’s a necessary conversation. It was incredibly distasteful, four days before one of the worst tragedies in our country, to say that I tried to hijack this event. […] It’s just really disappointing and disrespectful. We want to talk about disrespect, and me disrespecting, he didn’t even give both teams a chance to even stand in front of it and show their respects. It’s unbelievable. It’s truly an unbelievable act to me. Earlier this year, more than 100 US women gymnasts testified in the sexual abuse sentencing hearing for Dr. Larry Nassar. Nassar is now in prison, but the struggle to change the culture of the sport continues.